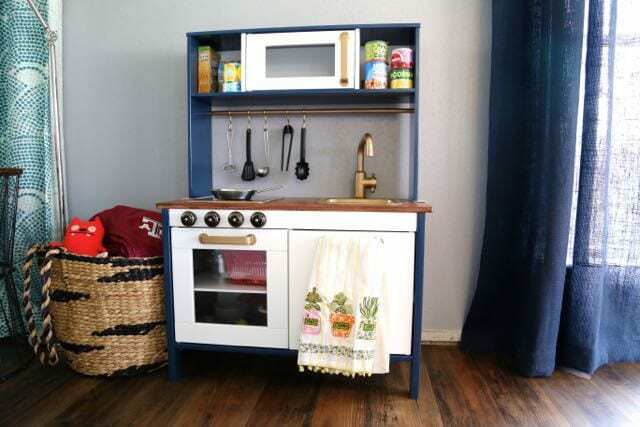 This IKEA play kitchen is a fantastic toy kitchen for kids of just about any age. 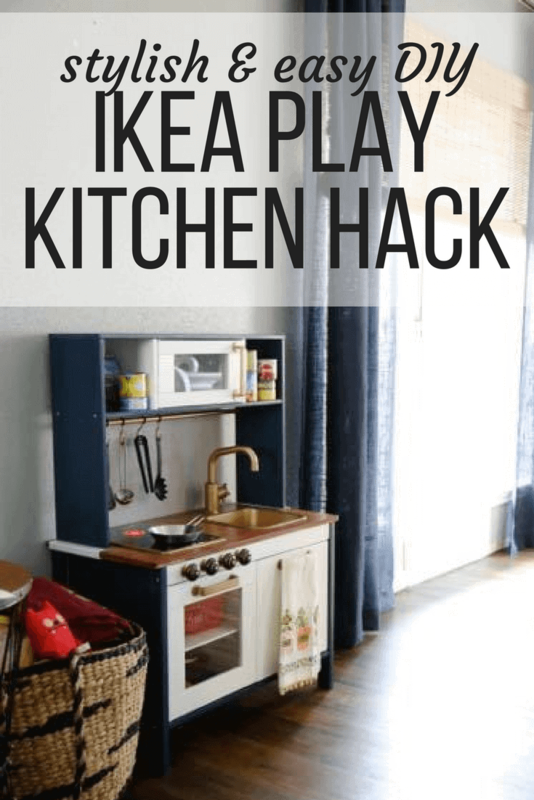 With a little creativity and love, you can take turn plain ol’ play kitchen into something elegant and gorgeous that will fit right in with the rest of your decor! My kid has a nicer kitchen than I do. If you follow me on Instagram you’ve likely already seen a billion photos of this kitchen because it’s where Jackson now spends 90% of his time. 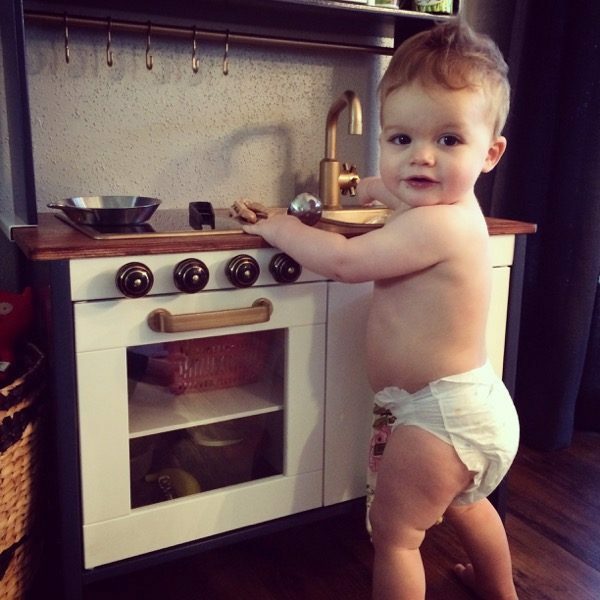 Seriously – if this kid is awake, he’s playing with the kitchen. I’ve had a lot of questions about it, so I figured it was high time I do a quick post giving up the details. We decided to get Jackson a play kitchen for his birthday for no other reason than we thought he might like it. We didn’t want to get him more random toys (he has plenty of those!) and we wanted something that was high quality and would grow with him. After looking at a lot of play kitchens online and not finding anything I was willing to place square in the middle of my living room, we landed on the DUKTIG kitchen from IKEA. It’s affordable and essentially a blank slate – perfect for customization! We debated colors and styles for a long time before deciding on anything for sure. I really wanted the accessories to be gold, and Corey really wanted it to be something other than white or gray. We also wanted something classic that would fit in with the rest of our living room, since that’s where it would be going. After much back-and-forth, we ended up with navy on the outer parts of the play kitchen, and leaving the white parts as they are. 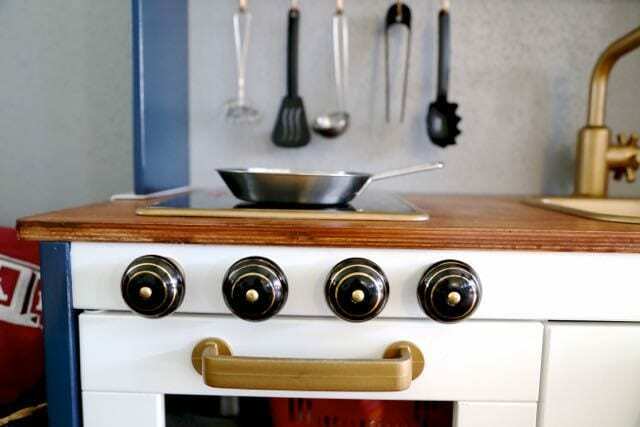 We also added in some cute drawer pulls we found at Hobby Lobby to look like stove knobs. Jackson loves to twist them, and I think they add a great touch and make it feel more “real”. One of my favorite parts of the kitchen is that it has little feet that can be added to the top so it grows with him. I think it will be usable for many years – the model that we looked at in the store was tall enough for an elementary-aged child! We got a ton of play food from various people for his birthday, so his kitchen is always well stocked. Our favorites are some cans and a cookie-making set from Melissa and Doug, and a shopping basket full of pretend versions of the store brand food from our local grocery store – it’s so cute to see mini versions of the food that’s actually in our pantry! I’m glad we took the time to spruce the kitchen up, because it’s visible from just about everywhere in the house. I love that because it means I can always keep an eye on him when he’s playing with it, and I actually love how it looks in the house. Now if only I could get my actual kitchen to look half this nice! HI! I love this kitchen!! So cute! Just wondering what kind of paint you used and how many coats were needed? Has the color held up pretty well? Thanks! I just used regular latex paint like you would use to paint a wall. We like Behr’s Marquee line from Home Depot. Typically 2 coats works best – and yes, it holds up great! That is an amazing kitchen. I really love this kitchen. I love this kitchen. Did you stain the counter top right is that contact paper? One more question. Did your mirror have a metal trim around the edge of the mirror. If so how did you deal with that? Hi Katya – I’m not sure I understand your question. There isn’t a mirror in the play kitchen at all…did you mean to comment on another post? I love the Melissa & Doug cookie set! I bought it for my niece a couple of years ago, and now I can’t wait till our daughter’s old enough so I can buy it for her too. And I love Jackson’s kitchen! I’m still a little torn on the wood vs. plastic kitchen debate though. I do think wood looks so much cuter, but since I had a plastic kitchen growing up that one has a little nostalgia for me. At least we have a little while before we’ll need to make a decision there! I can’t believe he’s 1. That waffle bar is AMAZING. Good Day! 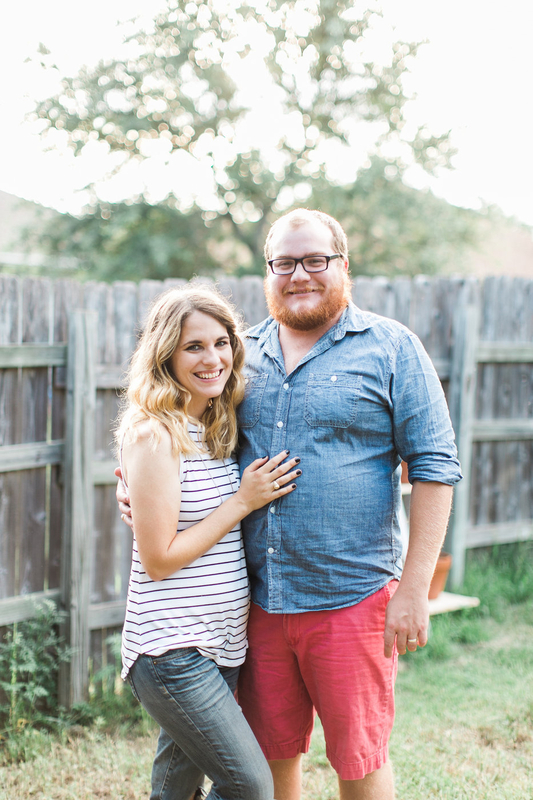 You do have a great blog, your house designs are great! I would like to know if you have used any pest control in your home? If not I am glad to show you our site, http://www.termitrust.com.au/ Feel free to drop by our page and so you could know more! 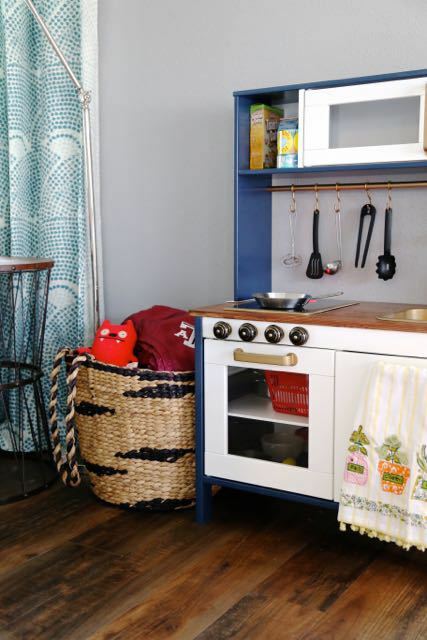 This is just adorable– by far the most stylish play kitchen I’ve seen!